For the first time since the turn of the 20th century, a Pope has reached the midpoint of his ninth decade as Benedict XVI marks his 85th birthday today. To commemorate the occasion, over the weekend the Vatican released a handful of photos showing Joseph Ratzinger with his closest confidant -- his brother, Msgr Georg Ratzinger -- in the pontiff's private chapel. 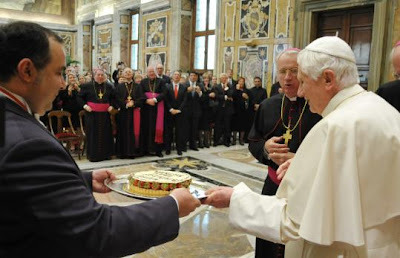 Having turned 88 in January, Der Papstbruder (ordained a priest with his brother on the same day in 1951) said in a recent book-length interview that, given his failing eyesight, Benedict reads him the daily prayers of the Breviary on their visits. The former director of the boys' choir of Regensburg cathedral, Georg Ratzinger lives at the simple home off a cul-de-sac outside the Bavarian city that his brother built in the 1970s with an eye to their retirement. The duo's middle sibling, Maria -- who moved to Rome with her brother on his appointment as prefect of the Congregation for the Doctrine of the Faith -- died in 1991. In his 2010 Q&A book with the German journalist Peter Seewald, the Pope said that the wristwatch he wears was left to him by his sister on her death. The last Pope to see 85 was Leo XIII in March 1895, eight years before his death closed a quarter-century reign. Come August, meanwhile, all appearances are that Benedict XVI -- now the sixth-oldest of the 265 bishops of Rome -- will surpass the tenure of Pope Benedict XV, whose relatively brief reign amid World War I was given by the current pontiff on his election as one of his reasons for choosing the name. 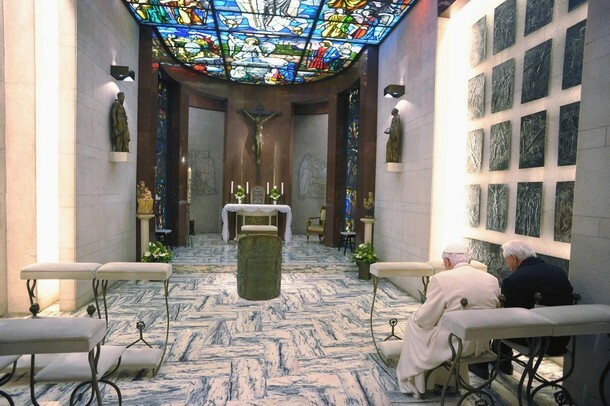 As the Pope has gradually curtailed his activities in order to conserve his energy, in an interview earlier this month with a German wire service, Msgr Ratzinger said he expected that his brother "won't travel that much anymore, because it's more and more of an effort." Still, much as today's milestone has spurred the predictable outbreak of chatter in the global press over a papal succession, as previously noted, any signs of an imminent vacancy on Peter's chair simply aren't showing in the cards at present. And, well, more on that in a bit. Giving the homily at the pulpit (as opposed to the usual ex cathedra preaching posture of the Popes), Benedict cited the enduring influence of the saint whose feast shares his birthday -- the visionary of Lourdes Bernadette Soubirous -- as his youth's prime example of "how we should be... that we can't lose a simple heart, the gaze of a simple heart that's able to see what's essential." Born on Holy Saturday -- the day that, in his words, marks "the silence of God, his apparent absence" -- the pontiff closed his unscripted reflection by saying that "I find myself facing the final phase of my life, and I don't know what awaits me. I do know, though, that the light of God is real, that he is risen, that his light is stronger than any darkness, that the goodness of God is stronger than any evil in this world. "This helps me continue on with confidence. This help carries us all forward, and in this moment I thank from my heart everyone who constantly lets me see the 'yes' of God through their faith."